Leading sports brand PUMA is pleased to announce that it will join with fans and international sporting stars at Sparta Prague’s stadium on Saturday, June 9th to celebrate the career of Czech footballing legend Tomáš Rosický. To mark the occasion of the retirement of the ex-Czech Republic captain and Arsenal, Borussia Dortmund and Sparta Prague player, PUMA will be part of the celebrations at a farewell match to be held at Prague’s Generali Arena. The final game of the ‘Little Mozart’, a nickname Tomáš picked up during his career thanks to his conducting skills, will be played between a TR10 Czech team, including national legends Jan Koller, Karel Poborský and Petr Čech, and a TR10 World Team, featuring international stars like Cesc Fàbregas, Alexander Hleb and Robin van Persie. PUMA, as a long-term partner of Tomáš Rosický, would like to pay its tribute with various activities around the city of Prague, on social media as well as at the stadium. 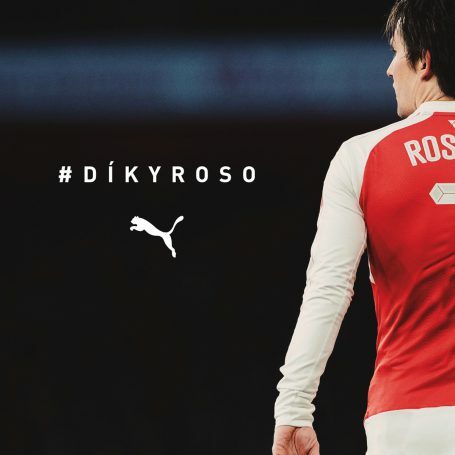 At the stadium PUMA representatives will distribute more than 18,000 ‘Rosický wigs’ to fans to wear during the match. A specially made Facebook mobile phone application with Augmented Reality camera effect will allow fans to apply virtual Mozart wig effects and share pictures on their profiles. Social media hashtags #DÍKYROSO and #MALÝMOZART have been created for fans to express their thanks to Tomáš for the joy he has given them over the years on the pitch. In the streets of Prague PUMA is already paying tribute to Tomáš via video mapping on buildings, with a ‘Hall of Fame’ in the shopping mall Arkády Pankrác available until June 20th, and on various city lights in shopping malls and public transport stands with hastag #DÍKYROSO.